The island of Crete is famous for its beaches. There are several outstanding beaches, which are among the best in Europe. The coast of Crete is over 1,000 km long. In some areas of the biggest island of Greece you can still find beaches without any people. There are both sand beaches and pebble beaches. Not all are accessible by car or even public transport. To some beaches on Crete you can only walk or you even have to climb down a cliff. Often such lonely coastal sections are a great destination for hikers.. In total there are many hundred beaches. Almost all have a name. 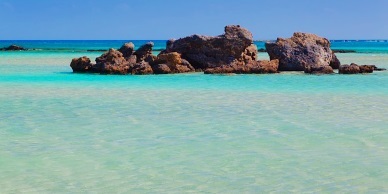 About four beaches on Crete are known for their beauty all over the island. These are two palm tree beaches and two "Caribbean beaches". The two famous palm tree beaches on Crete are Preveli and Vai. Preveli is located in the central south of the island near Plakias, Vai is in the north-east of the island of Crete. On both beaches the extremely rare Cretan date tree (Phoenix Theophrasti) can be found. This plant exists only on some beaches on Crete and in small numbers in Turkey. Very beautiful beaches that recall the tropics are in Elafonissi and Balos in the west of the island of Crete. Beach Elafonisi: This secluded beach in the south west of Crete is a great destination for a day trip by car, boat or bus. Beach Balos: This beach also has the typical Caribbean flair. It is accessible only by a dirt road or by excursion boats, especially from Kissamos. Buses do not go to Balos because of the bad road. Balos is located in the north-west of the island of Crete. On Crete there are at least 100 great beaches. Almost everybody has a different favorite. Which beach you prefer depends on the individual preferences. Some like beaches with bars and tavernas, other people secluded beaches. Some prefer waves, other protected calm beaches. There are sandy beaches and pebble beaches. Many tourists prefer a beach that is not more then a few meters from the hotel room. Some tourists only go to nudist beaches. Two beaches in Matala are well known and beautiful. The Matala Beach in town is famous for the caves where hippies lived some decades ago. More beautiful is to our opinion the Red Beach (Kokkini Ammos), about 20 minutes walk over a hill from Matala. A longest beach on Crete is located in the third largest city of Crete Rethymno on the north coast. It is almost 10 km long and ends in Platanes. Behind the city beach are kilometers of hotels, bars and tavernas. Back to the south, Komos Beach is one of my favorites. It is a long, wide beach with dunes at the small tourist resort of Kalamaki. Naturism is widespread here (see below). There are also good sandy beaches near almost all tourist resorts in Crete. In the tourist regions you can find the best water sport offers such as water skiing, boat rental and many more. Diving schools are also widespread. The only freshwater beach on Crete is around the Lake Kournas near Georgioupoli in the north of Crete between Hania and Rethymno. If you are looking for a sheltered beach, the beach of Elounda is a good option. There are seldom waves, you almost feel like you are at a lake. The highest waves on Crete are often found in the West. The beach Falasana is known for high waves. Surfers love the area. Good surfing beaches are mainly on the north coast. We saw many surfers on the beaches in the north-east of the island, in the Sitia and Palekastro region. At many beaches you can rent umbrellas and sun loungers. This is significantly cheaper in Greece (around 3 euros per person per day) than for example in Spain or Italy. Taverns are found on many beaches on Crete. Public toilets are rare, most people use the toilet of the next tavern. Parking on some beaches costs 1-2 Euros, more often parking is for free. At many Cretan beaches there is a small kiosk or shop where you can buy cold drinks and ice cream. Plakias and Damnoni: In Plakias on the end of the main beach outside the village (walk about 1.5 km along the shore). In Damnoni at the pig bay (Amoutaki) and at the One-Rock-Beach (Klisiti). Both are a few hundred meters east of the big beach of Damnoni. At the Sweetwater-Beach (Glika Nera), between the village of Loutro and Chora Sfakia, you can see many naked people. You can get there only by foot or by boat. On the beautiful beach of Triopetra there are in summer many people without clothes. On the sandy beach of Paleochora (Pachia Ammos) and on the pebbly beach of Sougia (both South West Crete) you can also get naked. In Sougia you can pitch a tent and stay overnight. Komos Beach near Kalamaki. 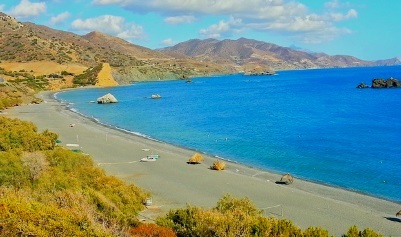 This is probably the most famous, longest and most beautiful nudist beach on Crete (central south coast). By foot you can reach Komos from the villages Pitisidia and Kalamaki. Also at Beach Lendas and at the Red Beach Matala you can see many people without any cloth. All the examples of nudist beaches above are on the south coast of the island of Crete. On the northern coast, however, there are almost no opportunities to tan the whole body. On the island of Gavdos (south of Crete, about 50 inhabitants) nudism is common in some regions.